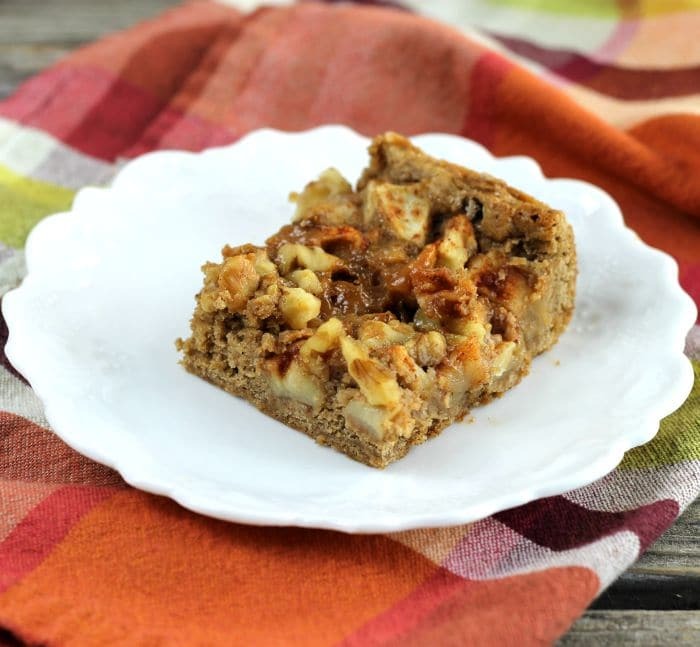 Caramel Apple Spice Bars moist delicious bars that start with a cake mix and are loaded with apples, caramel, and walnuts. Caramel Apple Spice Bars a simple to make dessert that starts out with a cake mix and is topped with apples, caramel, and walnuts. 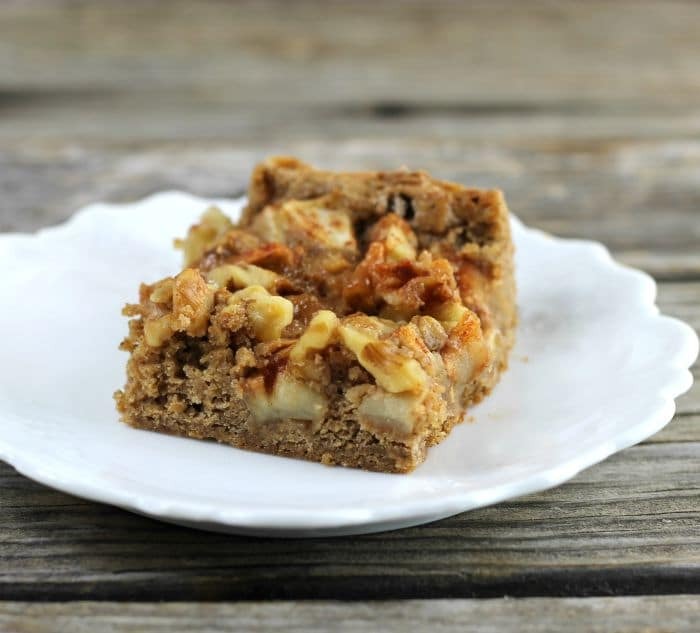 These caramel apple spice bars are perfect to make in the fall with the apples that are in season now. Apples are something that I have in the house at this time of the year. I love to take an apple in my lunch for work usually every day. But also I love baking with apples in the fall, well actually I love to bake apple desserts year round. But in the fall there is something special about the smell of apples and cinnamon baking in the oven. Maybe it is because fall is my favorite time of year and apples and cinnamon remind of fall. Not sure if that makes sense, but I hope you get what I mean. This recipe for the caramel apple spice bars is simple to make. 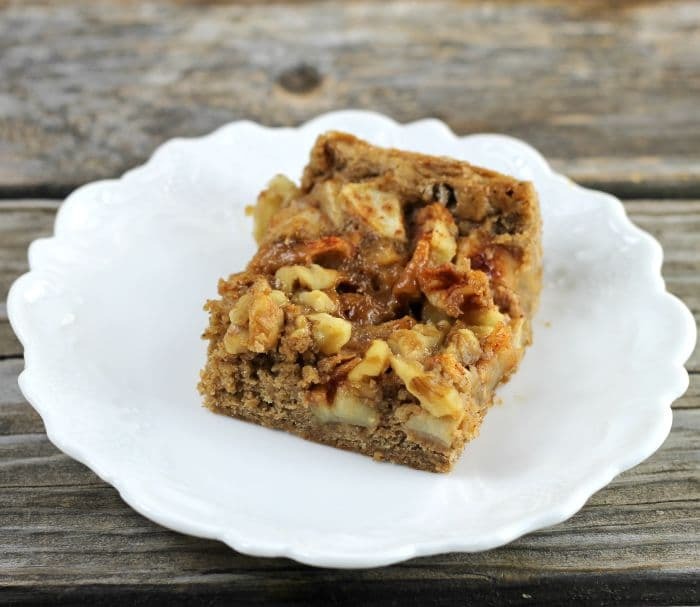 All you need to have on hand to make these bars is a spice cake mix, evaporated milk, caramel bits, cinnamon, apples, and walnuts. What are the best apples to bake or cook with? These are just to name a few. 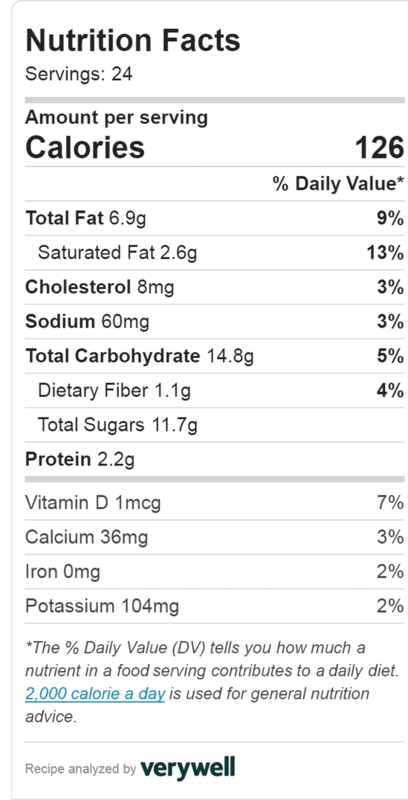 My favorite apples are Granny Smith and McIntosh to bake/cook with. In a medium bowl mix the spice cake mix, 3/4 cup evaporated milk and melted butter. Spread the mixture into the bottom of the prepared pan. In a small saucepan heat the caramel bits and the 2 tablespoons of evaporated milk. Heat over medium-low heat until melted. Stirring occasionally. Set aside. Peel and chop the apples into small pieces (3 small Granny Smith apples make about 3 cups). Toss the apples with the sugar, cinnamon, and flour. Sprinkle the apples over the cake mix mixture. Drizzle the caramel over the apples. Sprinkle the chopped walnuts over the caramel. Place the bars into the preheated oven. Bake 35 to 37 minutes or until when a wooden pick is inserted comes out clean. Cool on a cooling rack. Bars are best the first day they are baked. 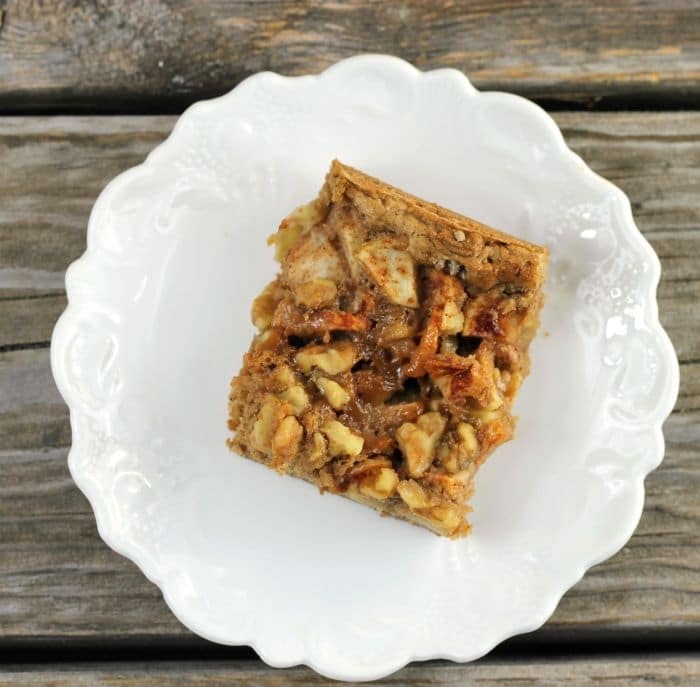 These spice bars look amazingly delicious with walnuts and caramel! Caramel and apples—you’re speaking my love language! These bars look terrific….and I love the short cut for those busy times when you need a dessert! Caramel and apples reminds me of getting caramel apples with a popsicle stick as a handle when we went Trick or Treating (it was along time ago). We have a spice cake mix here that would work. We don’t have Kraft caramel bits, but have nice caramel so I’ll be having a taste of this soon. There really is something magical about baking with apples and cinnamon at this time of the year! Not only does the house smell amazing, but it’s such a perfect dessert, too. Love how easy these bars are…and I love that caramel addition!